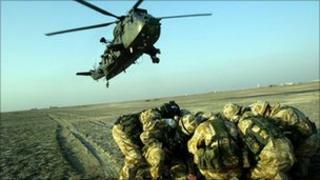 Mobile phones owned by relatives of UK soldiers killed in Iraq and Afghanistan may have been hacked by the News of the World, it is being reported. It comes after Prime Minister David Cameron said he would set up a public inquiry into alleged phone hacking. The Royal British Legion has dropped the paper as its campaigning partner. The services charity said it was "shocked to the core" by the claims and was reviewing its advertising budget with the paper's owner News International, which also publishes The Sun and The Times. The latest claims against the UK's biggest-selling newspaper come as Mr Cameron is due to consult other party leaders before reaching any final decision about the nature of the public inquiry. Government sources say the prime minister has "an open mind" about whether the probe should be judge-led, with witnesses giving evidence under oath. Deputy Prime Minister Nick Clegg and Labour leader Ed Miliband - who has said he was "disgusted" by latest allegations about soldiers - are both understood to favour such an inquiry. But Downing Street has said it was less likely that a second inquiry into the ethics of the media would need a judge to chair it. Police have not approached relatives of the soldiers but some families say a newspaper has contacted them suggesting they were victims of phone-hacking. MPH Solicitors - whose clients include Samantha Roberts, widow of one of the first Britons killed in Iraq in 2003 - said the firm was contacted by media on Wednesday morning about possible phone-hacking and was making efforts to verify the information. The former head of the Army, Lord Dannatt, told BBC Radio 4's Today the latest claims were "appalling". "It is really touching the sensitivity of families who have been through a tremendous amount - then to suddenly find what they thought was a closed issue after the death, the knock on the door, the repatriation and inquest, then suddenly gets opened again in this horrible way," he said. But he said the claims were "puzzling" as News International's papers had given the military "great support" in the past. Rose Gentle, the mother of fusilier Gordon Gentle, who was killed by a roadside bomb in Basra in 2004, said she wanted the inquiry to begin immediately and prosecutions to follow if the allegations were found to be true. She told the BBC there was a "lot of anger" among families and many were left wondering if their names were on a list of people whose phones were hacked. "The police should be contacting families straight away and putting them out of their misery." Jim Gill, stepfather of Second Lieutenant Richard Shearer, who was killed in Iraq in July 2005, told BBC Breakfast: "It is distressing for all the people who have been hacked, especially the people who are going through grief". Adrian Weale, of service personnel group the British Armed Forces Federation, said: "It's a disgraceful situation, if it in fact occurred. "If you do lose a relative in an operational situation it's a time of maximum anguish and grief and desolation, and the thought that a tabloid newspaper is poking around in one's private telephone calls and message for dirt to run stories is just unbelievable." Col Richard Kemp, former commander of British forces in Afghanistan, said the allegations made him "absolutely speechless with anger" while Conservative MP Patrick Mercer, who served in Northern Ireland in the British army, described the accusations as "very damaging". An MoD spokesman said: "This is a matter for the Metropolitan Police who are investigating these allegations. It would be inappropriate for us to comment whilst this investigation is ongoing." Shares in News International's parent firm News Corporation have fallen more than 3% in the US and Australia, amid concern over the possible impact the claims could have on the company's bid for the satellite broadcaster BSkyB. Meanwhile, a number of companies have said they would stop advertising in the News of the World. In a statement, Rupert Murdoch, News Corporation's chairman, said: "I have made clear that our company must fully and proactively co-operate with the police in all investigations and that is exactly what News International has been doing and will continue to do under Rebekah Brooks's leadership. "We are committed to addressing these issues fully and have taken a number of important steps to prevent them from happening again." The prime minister has expressed disgust at claims that the voicemail of murdered girl Milly Dowler was hacked, and some messages deleted. But Sara Payne, mother of murdered schoolgirl Sarah Payne, denied suggestions she may also have been a victim.